tear or damage your vehicles interior, upholstery, and leather seats. will not fit in your vehicles trunk, forcing you to put it in the back seat leaving no room for your customers to sit. leave mud and dried dirt throughout your vehicle requiring laborious cleaning of your vehicles trunk & upholstery. have influenced what kind of vehicle you buy, which was not the one you truly wanted. Torn seats? not with the EZ Frame. Where is a customer going to sit? Cleaning the interior is a hassle!! Buy a truck just for signs? The EZ Stow Sign is your solution to all these problems. The EZ Frames' strong 2" rolled carbon steel construction is Powder Coated to resist the harsh weather conditions. Fastner hardware for attaching removable legs is 100% Stainless Steel. All these make for a high quality sign that's made to last keeping replacement cost low, saving you money for years to come. Will fit in vehicles of all sizes, even the smallest of the small cars. Removable stakes can be easily cleaned or put into bags keeping your vehicles interior clean. When sign legs are in the stowed position, the sharp ends that usually damage your vehicles interior, upholstery, and valuable leather seats are safely tucked away preventing harm to your vehicle. Collapsible & compact so it will easly fit in your vehicles trunk while still allowing for maximum viewable sign area. 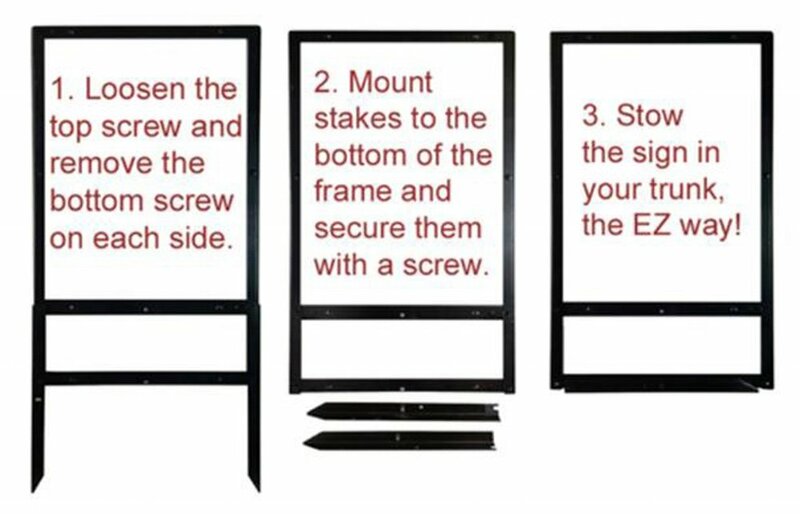 Ability to reuse and install your existing sign panels; no special hardware is required to attach the graphic panel to the EZ Frame. Still not convinced it's right for you? Let these excellent reviews from our loyal customers change your mind. Want to see how the EZ Frames' legs are removed? Click the video link below to see why the EZ Frame is the#1 rated yard sign in the industry.